The origins of the Gurjars are uncertain. 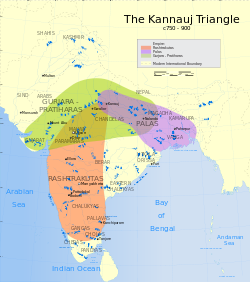 The Gurjara clan appeared in northern India about the time of the Huna invasions of northern India. Some scholars, such as V. A. Smith, believed that the Gujjars were foreign immigrants, possibly a branch of Hephthalites (“White Huns”). D. B. Bhandarkar (1875-1950) believed that Gujars came into India with the Hunas, and the name of the tribe was sanskritized to “Gurjara”. He also believed that several places in Central Asia, such as “Gurjistan”, are named after the Gujars and that the reminiscences of Gujar migration is preserved in these names. General Cunningham identified the Gujjars with Yuezhi or Tocharians.